The ACC Challenge - What does it mean for law firm technologists? I recently had the pleasure of speaking on a panel at the ILTA 2009 Conference in suburban Washington, DC. ILTA is "the premier peer networking organization, providing information to members to maximize the value of technology in support of the legal profession." The panel was organized by Bryan Cave partner John Alber, a longtime thought leader at the nexus of technology and the practice of law. See here for some excellent examples of his mind at work. I was joined by Connie Hoffman, CIO at Bryan Cave, a woman with a very distinguished career leading technology initiatives in the corporate sector, and Fred Krebs, the President of ACC, the Association of Corporate Counsel, which launched the initiative that formed the basis for our discussion. Fred has led his organization for many years into the tough issues surrounding the in-house counsel and outside counsel relationship. The panel was attended primarily by law firm technologists, most in senior roles, along with a smattering of law firm leaders from varying firm sizes. The purpose of the panel was, as described by the title, to describe the ACC Value Challenge and how it will impact law firm technologists. Or, more to the point, how law firm technologists can impact the ACC Value Challenge. Regular readers will recognize the ACC Value Challenge right away. ACC has put a voice and a framework around the need to improve the value proposition for long-suffering in-house counsel, that is, deriving quality work product at a fair price. I say long-suffering partially tongue in cheek. As I've written previously, any party who considers himself long-suffering at the hands of another is partly culpable for not changing his situation. ACC recognized that in-house counsel lament how the balance of economic power in their relationship with outside counsel has long been dominated by the law firms, so they decided to stop complaining and do something about it. Hear hear, I say. I commenced my remarks with this Gary Larson "Far Side" comic. I'd like to say that improving the dynamic between in-house and outside counsel, that improving efficiency, that deriving better value, is all about better use of technology tools. But it's not. Unlike the dog chieftain, it's not necessarily our time as technologists to save the day. At least not primarily through the use of technology. I strongly believe, through long trial and error in my own career, that real transformation comes from business process improvement, of which technology is and should be a vital component. I won't replay the entire panel discussion here, but I have provided a link below to an excellent recap of the session. I will, however, emphasize one of my closing points. While technology may not be a miracle cure to help law departments and law firms improve efficiency and drive costs out of commodity services, the processes that good technologists utilize to implement technology are exactly the skills needed now. Good technology implementations start with business process reviews, understanding what works, and what doesn't, what are the dependencies, where are the decision points, and so on. Then there is a rigorous methodology to move from idea to implementation, with tracking and reporting along the way to measure progress, and post mortem analyses to identify opportunities for improvement. In part due to the ACC Challenge, in part due to the efforts of the Legal Process Outsourcing (LPO) providers offering commodity legal services at a fraction of the rates charged by Biglaw, we will soon see more in-house counsel and outside counsel adopt project management techniques, allowing them to better deploy resources and reduce inefficiencies while continuing to deliver quality services. Technologists are perfectly positioned to contribute to this transformation by modeling these behaviors that are so vital to the implementation of good technology solutions. 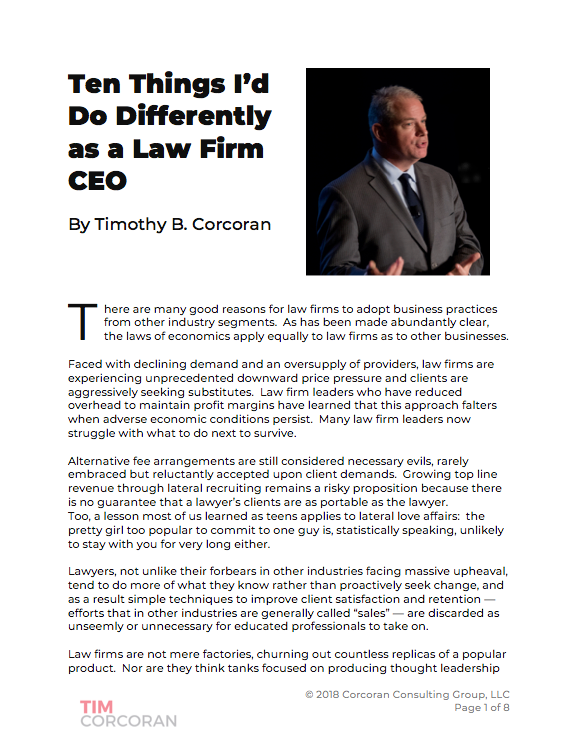 But be forewarned, a technologist braying that "technology is the answer" and ignoring business process improvement is as markedly out-of-step with the times as a Biglaw leader claiming that with the end of the recession will come a return to the rightful balance of power where law firms dictate the prices. You know who you are... don't you? For a much more robust recap of the ILTA session, see Susan Jacobsen's article here. See also Fred's commentary here.